This session is about how we take our Strategic Plan and turn it into action. It includes building our understanding of the Strategic Plan, playing a board game to develop strategies for building union power, and analysing our Area Councils' capacity in preparation for the year ahead. We will break out into area councils during this session. Tip for mobile users: This section works best if you turn your phone sideways. 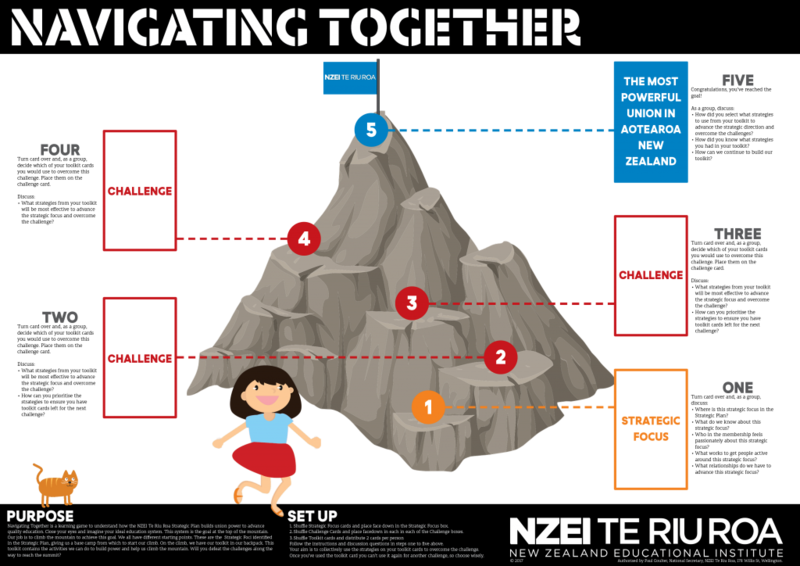 Navigating Together is a learning game to understand how the NZEI Te Riu Roa Strategic Plan builds union power to advance quality education. Close your eyes and imagine your ideal education system. This system is the goal at the top of the mountain. Our job is to climb the mountain to achieve this goal. We all have different starting points. These are the Strategic Foci identified in the Strategic Plan, giving us a base camp from which to start our climb. On the climb, we have our toolkit in our backpack. This toolkit contains the activities we can do to build power and help us climb the mountain. Will you defeat the challenges along the way to reach the summit? Interested in ordering a copy of the game? From Annual Conference, we have gained a number of new ideas and inspiring experiences. When we head home, people will want to hear of our time at the conference. How can we share our experiences in a way that inspires others to action? The 3C's is a framework we can use to help structure our story. It stands for Challenge, Choice, and Change. The framework takes people on a journey of "I have done this awesome thing and you can do it too." For example: "In Welby’s talk, I was challenged by the idea that, in the class room, I sometimes need to disobey the rules in order to effectively teach kids." For example: "I was challenged to disobey the rules to do what’s best for children. This gave me a choice, do I follow the rules and fail my children, or do I do what I know is right in my heart?" For example: "I was challenged to disobey the rules to do what’s best for children. This gave me a choice, do I follow the rules and fail my children, or do I do what I know is right in my heart? I’m choosing to do what I know is right for children and this means they will be able to succeed in their learning."